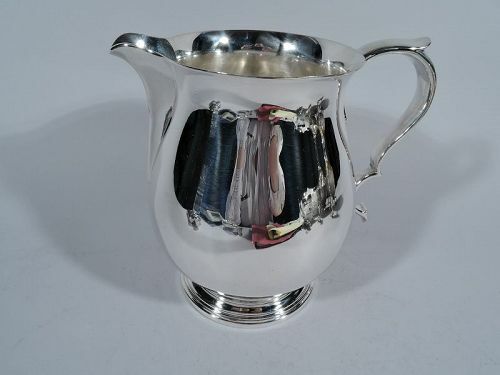 Stylish Modern sterling silver water pitcher. Made by Tiffany & Co. in New York. Curved body, flared, rim, capped double-scroll handle, and stepped foot. Spare and supple with a distinctive v-form spout on front. Hallmark includes pattern no. 19873 and director’s letter M (1947-56). Very good condition. 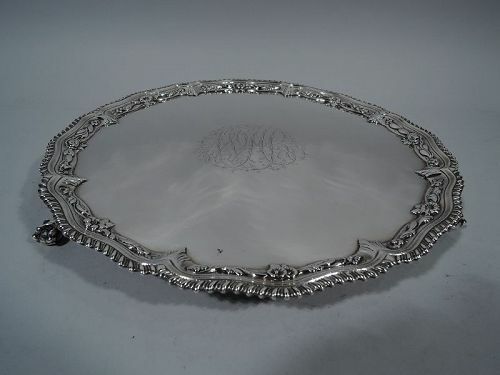 Edwardian sterling silver bowl. Made by Tiffany & Co. in New York, ca 1910. Round and solid well. 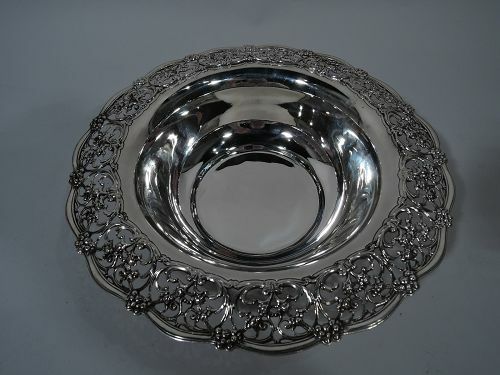 Scalloped turned-down rim with pierced scrolls and flowers. Fresh and pretty. Hallmark includes pattern no. 17790A (first produced in 1910) and director’s letter m (1907-47). Fine condition. 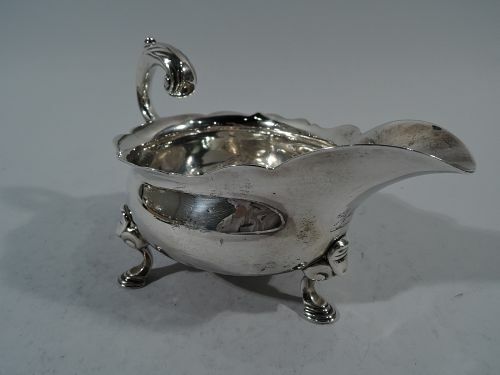 Sterling silver gravy boat on stand. Made by Reed & Barton in Taunton, Mass., ca 1910. Chamfered corners and reeded rim. Boat has helmet mouth, domed foot, and capped scrolled bracket handle. Scrolled and lined frames with stylized flowers and leaves. Hallmark includes no. 626. Very good condition. 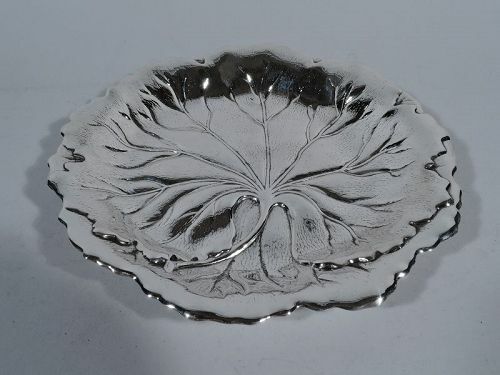 Beautiful sterling silver leaf bowl. Made by International in Meriden, Conn., ca 1950. Round with tapering sides and irregular rim. Interior veined and striated. Hallmark includes no. H125. Very good condition. 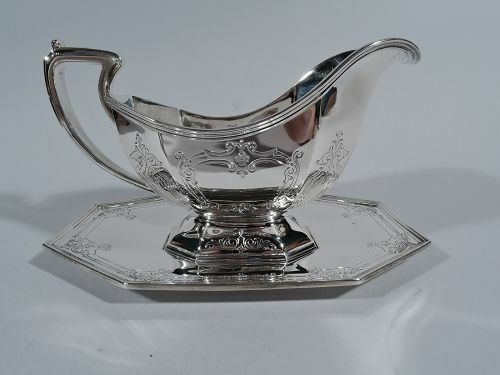 George II sterling silver gravy boat. Bellied bowl with scrolled helmet mouth and leaf-capped double-scroll flying handle. Rests on 3 hoofs with volute scroll mounts. A great piece of sturdy, working Georgian. Worn hallmarks with London date letter from 1739-55. Good condition and patina. 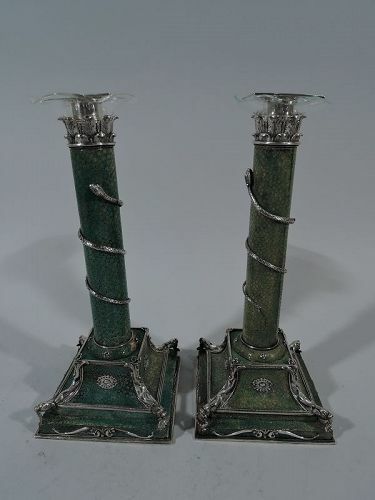 Pair of European shagreen and silver candlesticks, ca 1880. Each: Column on raised square base covered with green-tinted shagreen. 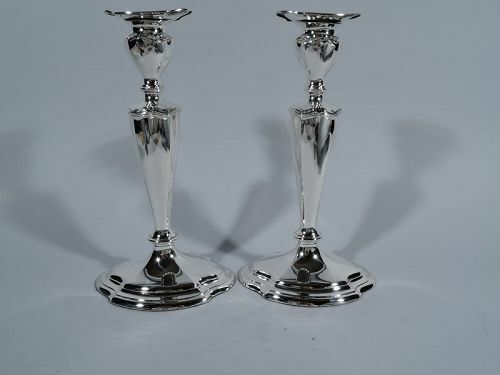 Silver Corinthian capital with detachable and wavy clear glass bobeche and beaded and square silver socket. Column encircled with scaly snake. 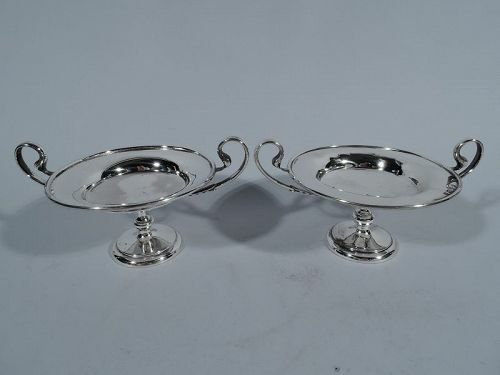 On base silver mounts including paterae and scrolls as well as dolphins at corners. Unmarked. 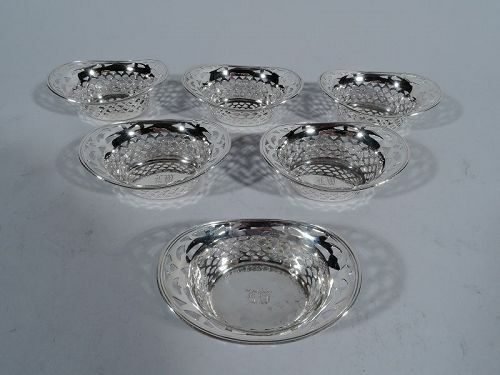 Set of 6 Edwardian sterling silver nut bowls. Made by Webster in North Attleboro, Mass., ca 1910. Each: Solid oval well, pierced fish scale sides, and flared rim with pierced scrollwork. Monogram engraved in well. Hallmarked. Very good condition. 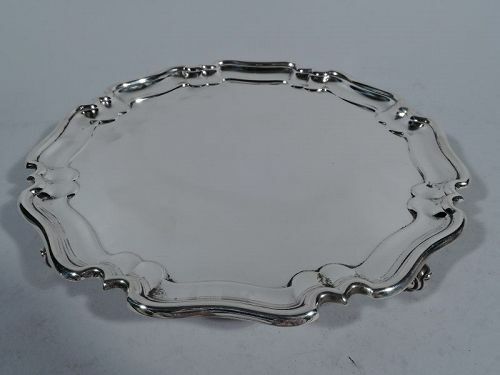 George III sterling silver salver. Made in London in 1766. Round with 3 ball-and-claw supports. Fancy gadrooned rim with soft ogee arches and raised garland. Well center has ornamented interlaced monogram. 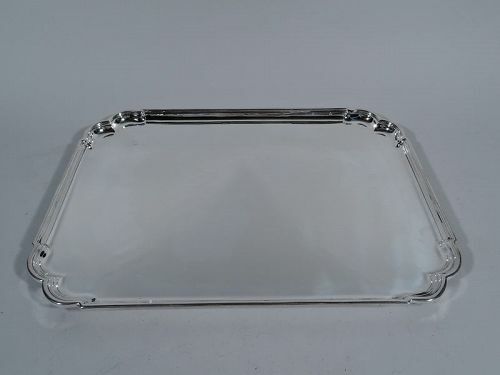 Hallmarked RR for salver maker Robert Rew. Very good condition with attractive period wear and patina.